While the LSU football team’s focus was on the field during Saturday’s spring game, there was a big program impact off it after the game ended. 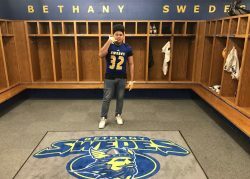 Jaden Navarrette who is a elite 2020 tight end/linebacker, was here back on campus visiting with LSU commit fellow California Elias Ricks 5-star DB. Ricks and Navarrette played for IE Ducks little league organization. He decided to commit to the tigers this evening after speaking with his uncle and LSU coaching staff. 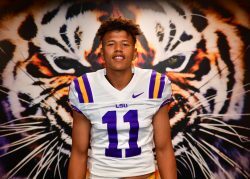 “Navarrette says it just feels like home the coaches, the staff and the fans are just unreal.” Navarrette visited LSU in February after the annual SPE Elite National Camp on a unofficial visit and love what LSU stands for.